Slowly, laboriously, you push your small cart up the muddy road to the city gate. The bloated, sneering visage of the Sheriff of Nottingham looks you up and down before turning his gaze to your cart and its bulging sacks of goods. “What have we got here?” he spits. It is then that you realize that the Sheriff is standing with palm outstretched, expecting something- a bribe. As you dig in your coin purse for a few grimy coppers, you know that you will be lucky to make it out of this town with the shirt on your back. All five merchants, vying to have the most net worth at game’s end. Sheriff of Nottingham is a bluffing game for 2-5 players from Arcane Wonders, with games lasting generally thirty to forty five minutes. Each round, a player takes on the role of the corpulent Sheriff. Each other player then will take a selection of goods cards from their hand, place it in their satchel and then pass the satchel to the Sheriff. Players then each declare their good to the Sheriff, claiming to have so many cards of a single type in their satchel (either Apples, Bread, Cheese or Chickens.) Players cannot lie about how manycards are in their satchel, but they can lie about the type. In addition to these four legal goods there is also expensive contraband that can be smuggled into the marketplace for a tidy profit. So what ensues is this: if the Sheriff thinks you are lying about what is in your satchel, they may snap open its clasp and reveal your cards. If you were lying, you must pay the Sheriff a penalty for every erroneous card (which are then discarded). However, if you were telling the truth, the Sheriff must pay you a penalty for all of your cards. What’s more, anyone can offer a bribe to the Sheriff to either open, or not open a bag. That bribe can consist of money, goods that they have collected at their market stall, or even the promise of future favors (but promises can be broken.) Once everyone has each had two turns at being the Sheriff, the game ends. Each player totals up their amount of money, the value of their goods, and any bonus awarded for having the most or second most of a single type of goods amongst all the players and whoever has the largest net worth is the winner! So with all that being said, dear readers, what do I make of it? Well, the mechanics of this little gem are rather well thought out, with no major issues. If I did have to get nit-picky, I would say the same thing that many other reviewers have said before me- the problems lie in the cards and the scoring system. First, the amount of cards in this game is massive- and shuffling them (if you don’t have a shuffling machine) can take up quite a bit of time. Second, the scoring at the end is rather laborious. You’ll need a pen, paper, and not to be in a rush as each person calls out their various values and amounts of each goods (in addition to the amount of their cold hard cash). A photocopy-able form in the manual would have been much appreciated, but I suppose you can’t always get what you want. Taking that into account, though- this really is a marvelous little game. 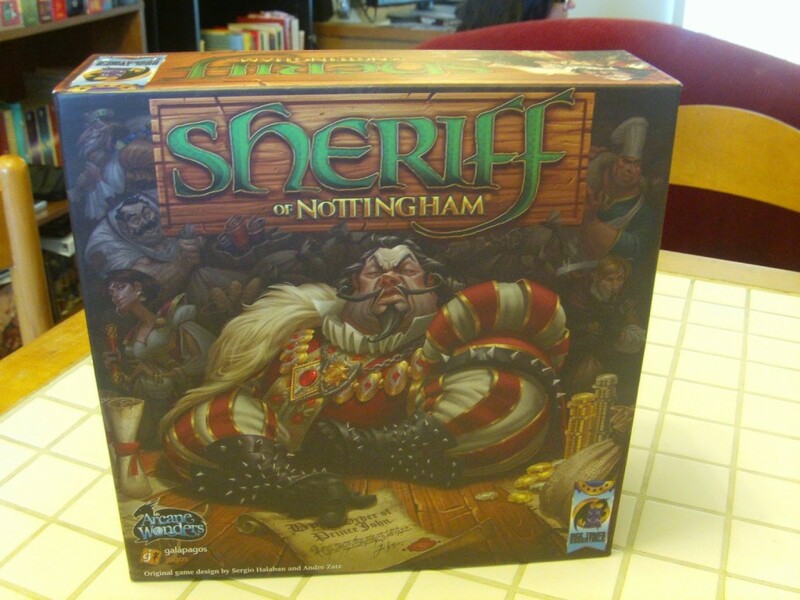 Bluffing games are one of my favorite types to play (if you don’t believe me, check out my review for Ca$h ‘n Guns if you haven’t already) and Sheriff of Nottingham really executes the concept well. You will be sweating bullets as the Sheriff holds your bag, rubbing its felt-like texture as they ponder just exactly what to do with you. Or you’ll be sweating bullets as you sit there, trying not to look like you want them to open your bag. Soon, players will be messing with each other and the bribes will begin to flow freely. What’s more, there are not a lot of rules to remember and not a lot of pieces on the table, making this a great game to play with beginner gamers. So check out Sheriff of Nottingham, dear readers and see just how much money you can squeeze out of your friends. Want to see if you can make those pitiful peasants cough up a few more coppers? If you live in the Bloomington area, you can check out this game at The Game Preserve. If not, check it out at your local game store. Support local game stores!